A large trough with a deep cyclone moves across W Europe with a secondary low crossing N France and Benelux, while an associated cold front pushes east as well. Very cold maritime airmass will be advected behind the front across the E Atlantic. Some ridging is expected across most of the Mediterranean while another short-wave trough will affect the SE Mediterranean while deepening and moving towards Turkey. A surface low will form ahead of it. Elsewhere, a weak high pressure centered over NE Europe provides stable conditions. A MDT RISK area has been issued for SE Mediterranean into far SW Turkey with threat for severe winds, torrential rainfall, large hail and tornadoes. Rather impressive parameters are shaping up for a dangerous severe weather setup through late Wednesday ahead of a rapidly approaching through axis / front from the west. Ahead of the trough, a surface low forms and an enhanced southerlies result in strong warm advection across the risk area and environment becomes moderately unstable. With the very strong jet rounding the base of the through, strong shear is in place, having a good overlap with instability of near 700-1000 J/kg of MLCAPE by the late afternoon and evening hours. This suggest robust severe storms are likely to form, organized into supercells and bowing segments. The environment seems supportive of severe storms with large to locally even very large hail, and tornadoes near the coast of SW Turkey where parameters seem maximized. A strong tornado cannot be excluded, given the strong LL wind field and shear / SREH. Widespread forcing should provide initiation of numerous severe storms near and just ahead of the main cold front which warrants the MDT RISK area. Storms will gradually grow upscale into a large convective system (MCS) late Wednesday while spreading into WSW Turkey, before diminishing further inland as instability vanishes in the complex terrain and with cooling of BL at night. Excessive rainfall threat seems likely as well due to the higher number of storms and cluster maintaining near the coastal areas of SW Turkey. 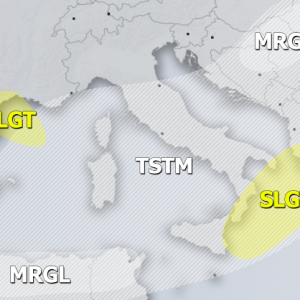 ENH/SLGT/MRGL RISK areas have been issued surrounding the MDT risk area across SE Mediterranean, including extreme S Turkey, Rhodes island, east Crete island and Cyprus with threat for severe storms capable of producing severe winds, heavy or torrential rainfall and marginally large hail. Storms coverage should be less concentrated in these areas, but unstable conditions and robust wind profiles suggest organized storms are well possible. Especially across S Turkey towards Cyprus late Wednesday when a cluster of storms seems likely, coming from the SW. Storms should merge with the ongoing severe storms earlier when the main surface cold front pushes through. Storms should continue into the night hours while the trough pushes NE overnight. A MRGL RISK area has been issued for open waters SW of British Isles with threat for severe winds and marginal hail / graupel showers as very cold mid levels overspread the risk area in the maritime airmass behind the main cyclone and sharp cold front going through earlier. A TSTM RISK area has been issued surrounding the MRGL risk area including S Ireland, SW UK and NW France where some low-topped storms are possible, no severe weather should be expected.